Sorry for the delayed post -- we've been without power. Meanwhile up in Minnesota, Matt was getting ready for his two races -- the 5000 meter on Friday and the 1500 meter on Sunday. On Thursday he had hoped to make it to a dynamic speaking event, but it was delayed a few times due to flight delays of the speaker. Matt decided to spend his afternoon getting acquainted with the University, and more importantly, the track. He got in a workout, though he said he felt sluggish. He ran into one of the athletes he met in Mesa last year and the two of them and another athlete all went out for dinner. He sounded excited yet nervous when I spoke to him later that night. On Friday he had a long day of waiting before his 7:30 pm race. He took his work laptop with him so he could get some work done and help pass the time. He headed over to the venue a little before 5 and was able watch the visually impaired 800 heat. He did some striders and warmed up. A bit later his cheering squad arrived. My dad's family is from Wisconsin so Matt had a great turnout of support from Aunt Jean, Aunt Cathy, Andy, and cousins Bill and Sheila. Andy brought his high-tech camera and served as Team Rodjom official photographer. Thank you so much, Andy! 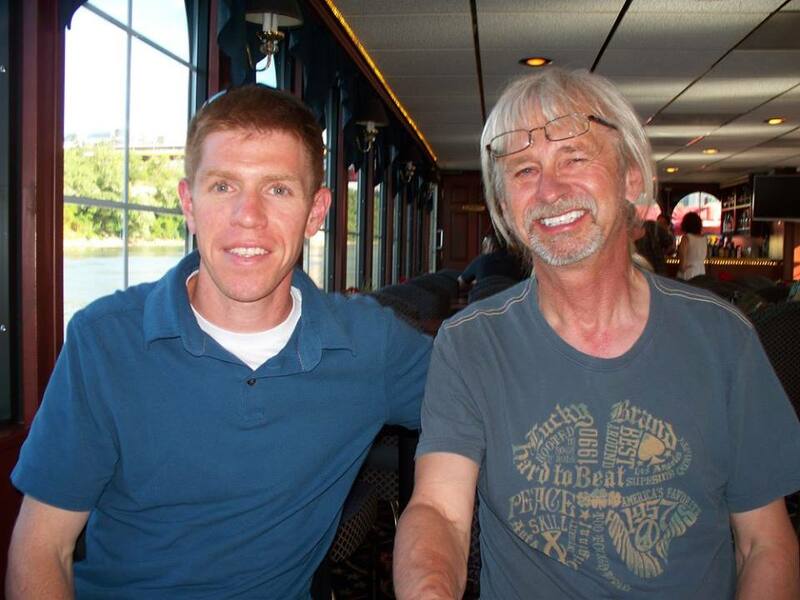 I'm sorry I couldn't be there to cheer on Matt, but it is so wonderful to know that he was surrounded by family. Matt decided to wear his compression calf sleeves. He wore them in the StarKids 5K and didn't mind having them on in the heat so he decided to wear them again. There were four runners in Matt's heat. Matt was in lane 3 with no one in lanes 1 or 2. The other runners were in lanes 5, 7, and 9. 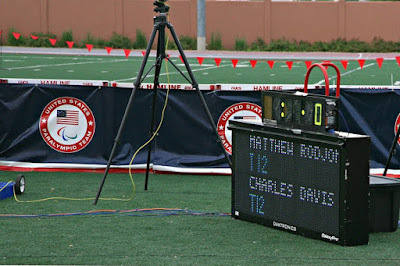 Matt's only other experience with paralympic events was Mesa so he forgot that numbers must be visible or he could be disqualified. 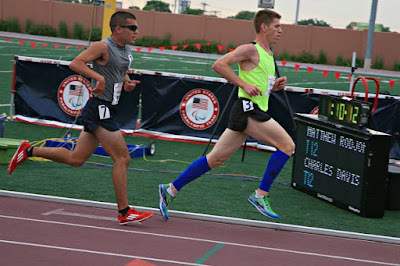 One of the other runners, Chaz Davis, has the same visual impairment that Matt does -- Leber's Hereditary Optical Neuropathy (LHON). He's a college kid and very fast. Chaz and Matt are both classified as T12 runners. The other visually impaired runner, Michael Kinoshita, is also a college kid and very fast. The final member of their heat was not a visually impaired runner so would be in a separate ranking for those with brain injury. As soon as the gun sounded Chaz was off and Matt never saw him again. He and Michael stuck pretty close together, settling in at about a 5:20 mile pace. At about lap seven Matt started to struggle with his pace a bit so he tucked behind Michael. He kept looking at the flags to make sure he didn't get a red disqualification flag for not having his number visible. With 300 meters to go, Matt decided to surge. He finished in 17:02, which is a personal best for Matt. His previous personal best was a 17:05 circa 2002. Chaz finished in 16:09 and Michael in 17:13. Since Matt and Chaz are both T12, Matt took home silver for the 5000. 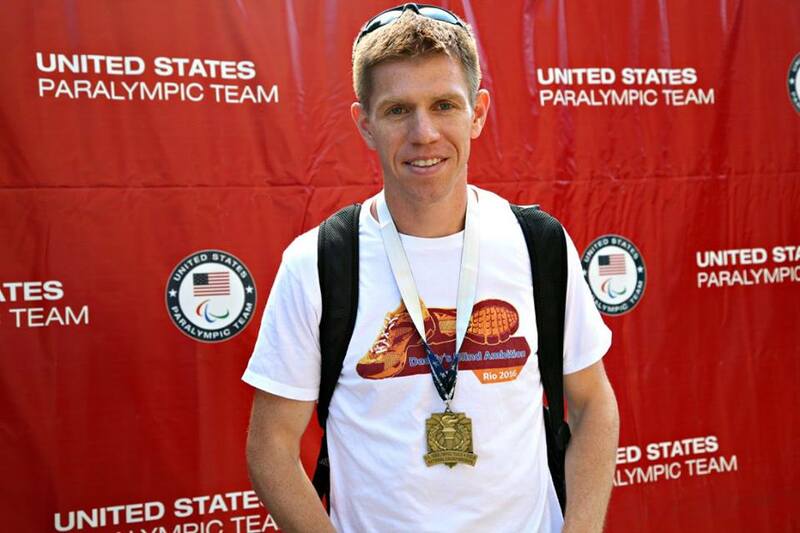 Matt met the Parapan Am Games qualifying time of 17:20. We are waiting to hear if he will be chosen to represent the United States in Toronto in August. After a one-mile warm down with Chaz and Michael, Matt and his cheering team all went out to dinner to celebrate and catch up. He slept well Friday night! Saturday was a low-key day of spending time with family. 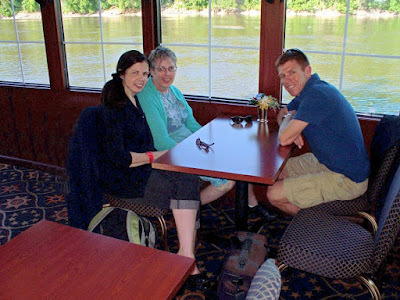 They went on a river cruise for dinner which happened to serve the best pre-race meal, pizza. The kids and I called Matt early on Sunday to wish him good luck and a Happy Father's Day. The kids made him a trophy before he left and a card, which he took with him for good luck. We were all a bit bummed that we weren't together on Father's Day. Matt was feeling tight so he wasn't sure how the race would go. Then, when he started warming up, he had strong pain in his hamstring. Well, in the end, Matt ran a 4:35. His PR in the 1500 is a 4:23 (in his college days). He was hoping to have run a little faster, but was still feeling ok about his time. He said the entire 1500 felt like a sprint and in the last lap when he usually has enough energy left for a surge he had nothing left. Matt came in third, but took home gold since he was the only T12 in the race (the other runners were T13). Michael came in first with a 4:27 and a young college student, Branden Walton came in second in 4:31. Matt missed the qualifying time for the Parapan Am Games in Toronto. He needed to run a 4:30 in the 1500. None of the athletes made the qualifying time since T13 runners are required to run faster than T12 runners. Matt had lunch with his cheering team before they headed back to the Madison area and he spent the rest of the time exploring the city. He also caught up with Kristin, a former DC RoadRunner who lives up in Minnesota now, for dinner. Below are a few pictures from the weekend. Andy took many more and I'll post those when I receive the thumb drive in the mail. In the meantime, happy Friday!